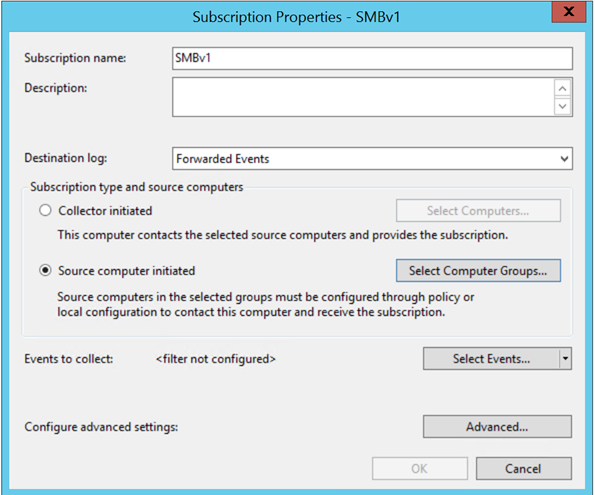 Step by Step: Safely disabling SMB v1 from your production environment. 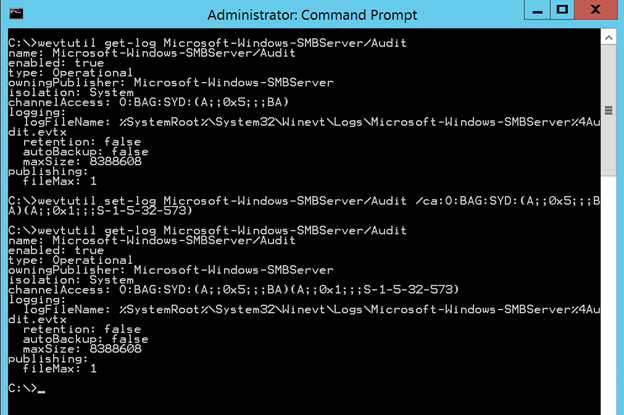 · Enable Auditing on SMB Servers. 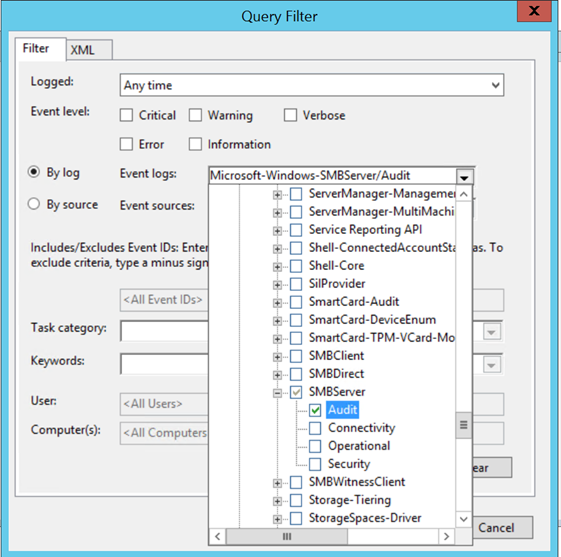 · Retrieve Events on an Excel sheet and analyzing SMBv1 traffic. First Question, on which servers we need to enable auditing? the answer is simple, all SMB servers. 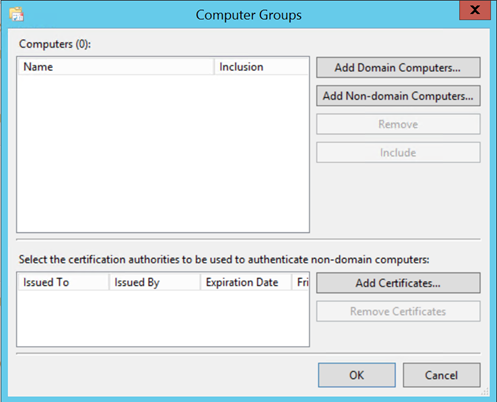 Domain controllers are a good example, client computers and member servers use SMB to access SYSVOL and NETLOGON shares to apply group policy, so domain controllers are servers to audit. File and print servers also need to be audited. In my scenario I have three concerned servers: DC01 and DC02 are domain controllers, MEM01 is a file server. All of them are running Windows Server 2012 R2. 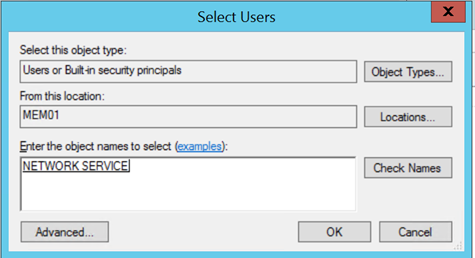 After enabling the audit, an event will be logged each time a client computer access server using SMB v1. 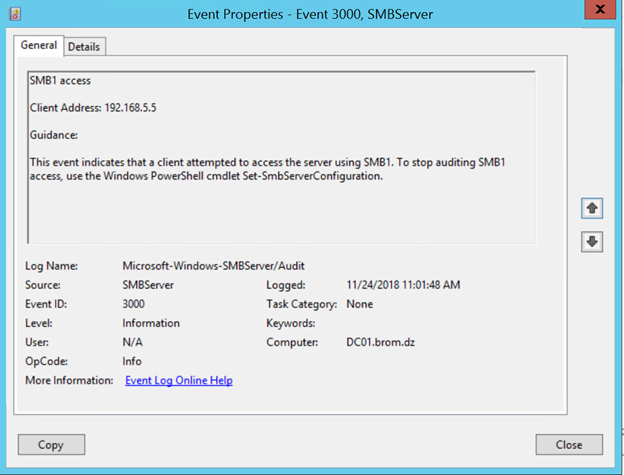 As you can see on the screenshot above, the event indicates SMB1 access and give you the client IP address. 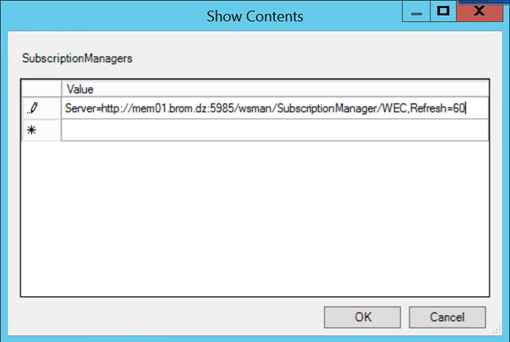 Note: The command Set-SmbServerConfiguration -AuditSmb1Access $true will not work on a non-updated Windows Server 2012 R2, please install the latest monthly rollup to be sure everything will work just fine, till writing of these lines the latest monthly rollup is October 2018. https://support.microsoft.com/en-us/help/4462926/windows-8-update-kb4462926. 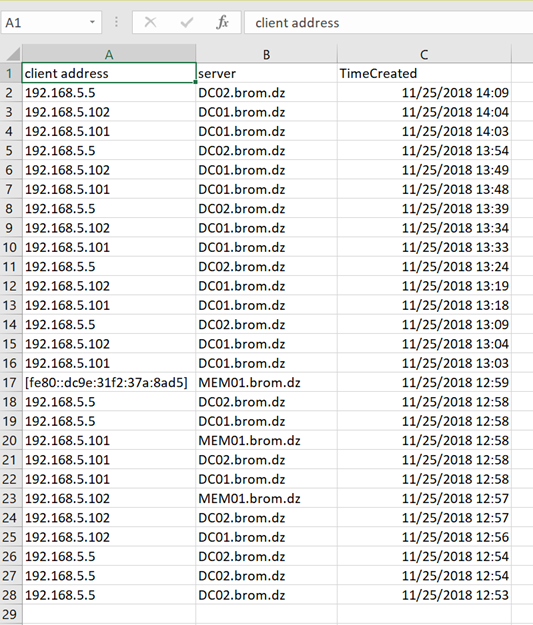 Imagine you have a huge environment, let’s say more than 50 domain controllers or maybe more than 100, how you will analyze SMBv1 events on all these servers, here where windows event forwarding will be very useful to centralize logs for better analyzing. 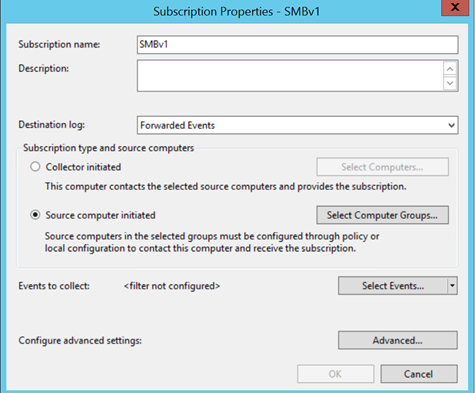 Below the steps to centralize SMBv1 events on the server MEM01. 1. 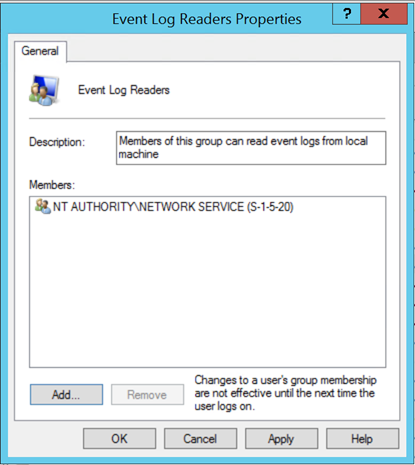 Add the network service account as member of the group Event Log Readers on all audited servers. 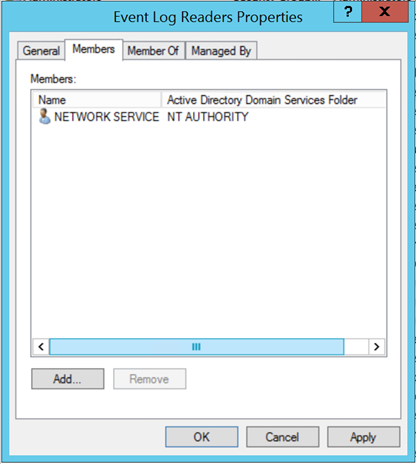 On Domain Controllers use Active Directory Users and Computers. On Member servers use Computer Management console as shown on screenshots below. 2. 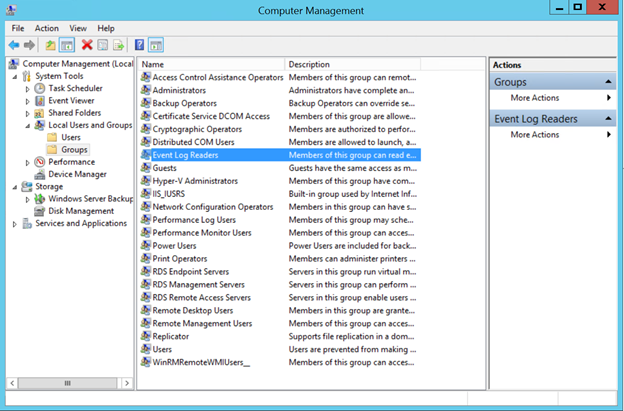 Give the Event Log Readers group permissions to access SMB Server audit Logs. 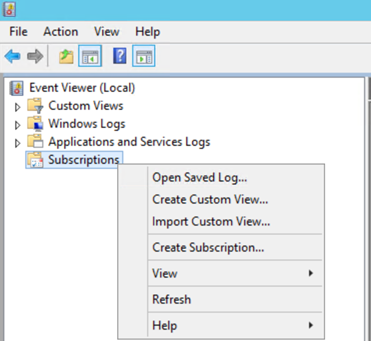 By default, Event Log Readers members have permissions to access Security and System logs…etc. 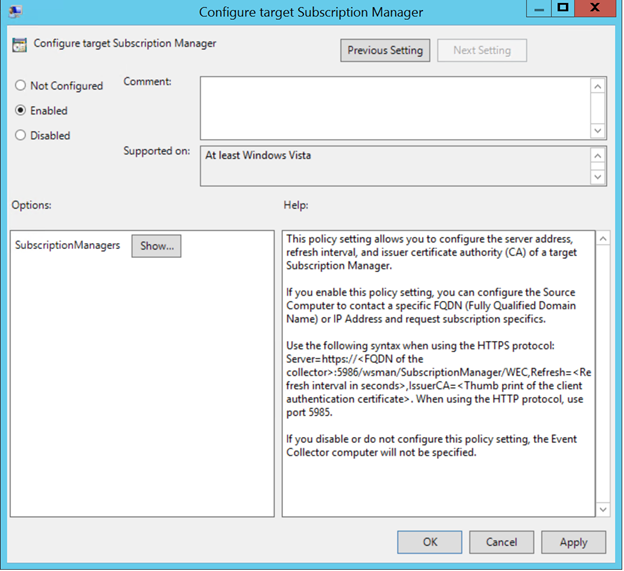 But they don’t have permissions to access SMB Server Log. Open command prompt as administrator and run the following command on audited servers. Click on Subscription and then Click Yes. Click on Select Computer Groups. 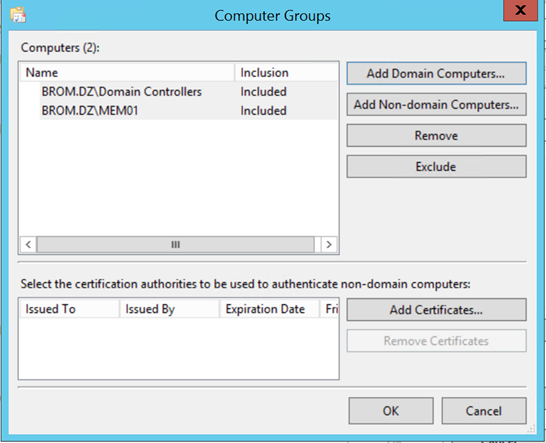 Include the group Domain Controllers and MEM01. Choose the SMBServer Audit log. Type 3000 to forward only Events with Event ID 3000. 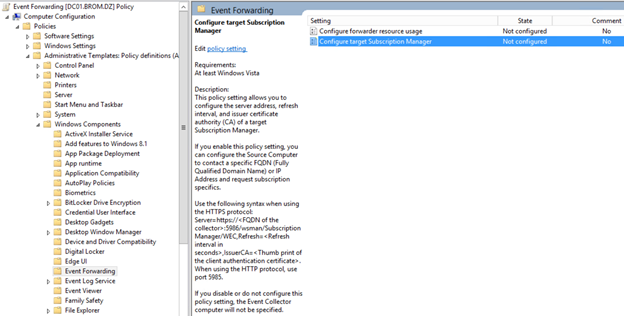 Enter the URI of the event forwarder server. In my example MEM01. My GPO is named: Event Forwarding. 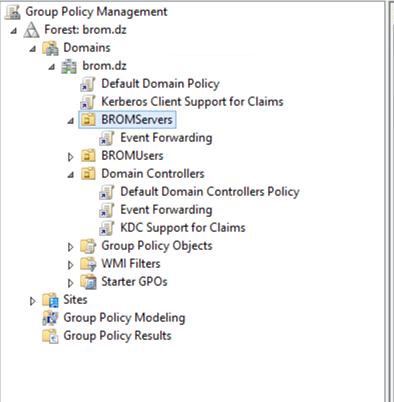 The GPO is linked to domain controllers OU and BROMServers OU. you might need to restart the servers before beginning viewing events on the Event forwarding server (MEM01). 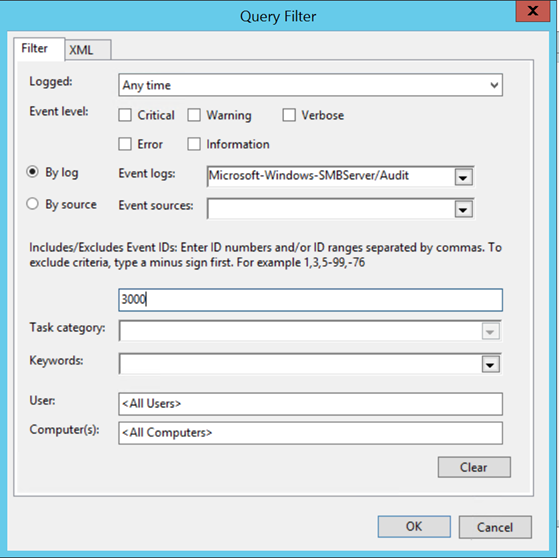 Retrieve Events on an Excel sheet and analyzing SMBv1 traffic. Use the PowerShell script below to export the events on a nice Excel Sheet. 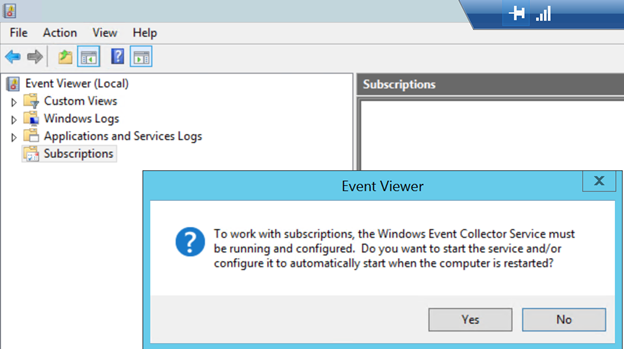 Run the PowerShell code below on the event forwarder server (MEM01). Screenshot of the csv file opened on Excel. With Excel you can see the devices and computers using SMBv1. After treatment of all the devices you can disable SMBv1 safely . 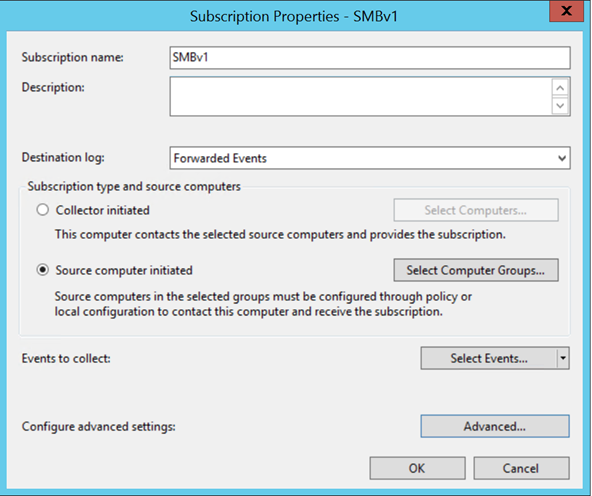 The most important thing when disabling SMB v1 from production is auditing, following steps on this article you will have all the devices talking SMBv1 with your SMB Servers, you need to understand why these clients are talking SMBv1 and how to remediate, after treatment of these devices you can safely disable SMBv1 using the steps on the article below.